Hello! Gwen tweeted this gorgeous photo today in support of World Food Day. She wrote “Incredible work @michaelkors and @WFP are doing to fight global hunger. 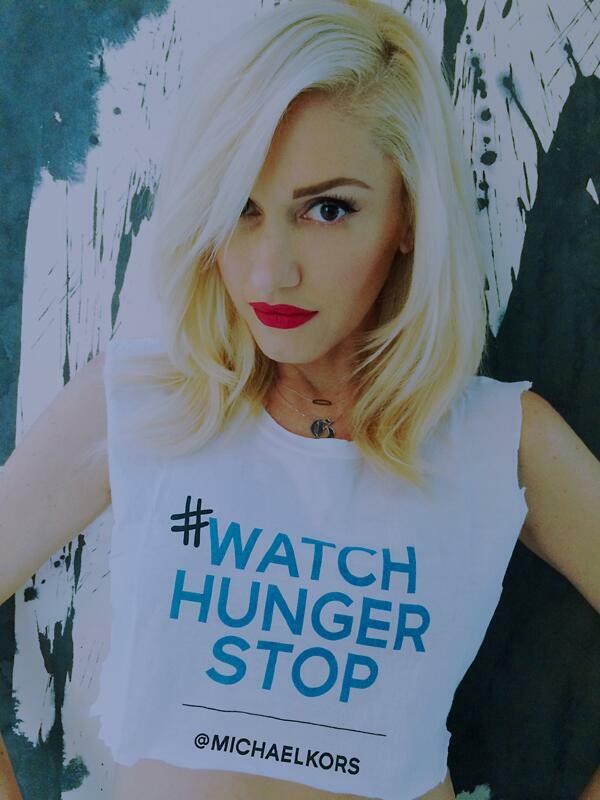 gx #watchhungerstop #WorldFoodDay” The shirt was designed by Michael Kors. He’s partnered with the United Nations World Food Programme (WFP) to help fight global hunger. The shirts were given out today at six participating Michael Kors stores. Please visit his site for more information. In case you’d like to help, WFP tweeted “Join @MichaelKors & @Google to #watchhungerstop when you download the One Today app & give $1. http://bit.ly/H1gset“. Hello! Adrian was interviewed on the raunchy new Breal.tv web show called Hot & Heavy today. I’ve added it to the downloads section. It’s missing the first five minutes due to some technical difficulties, but that’s not so bad since it was an hour long show. Hello! No Doubt tweeted a group photo (sans Gabe) early this morning with the caption “Just hanging out…”! 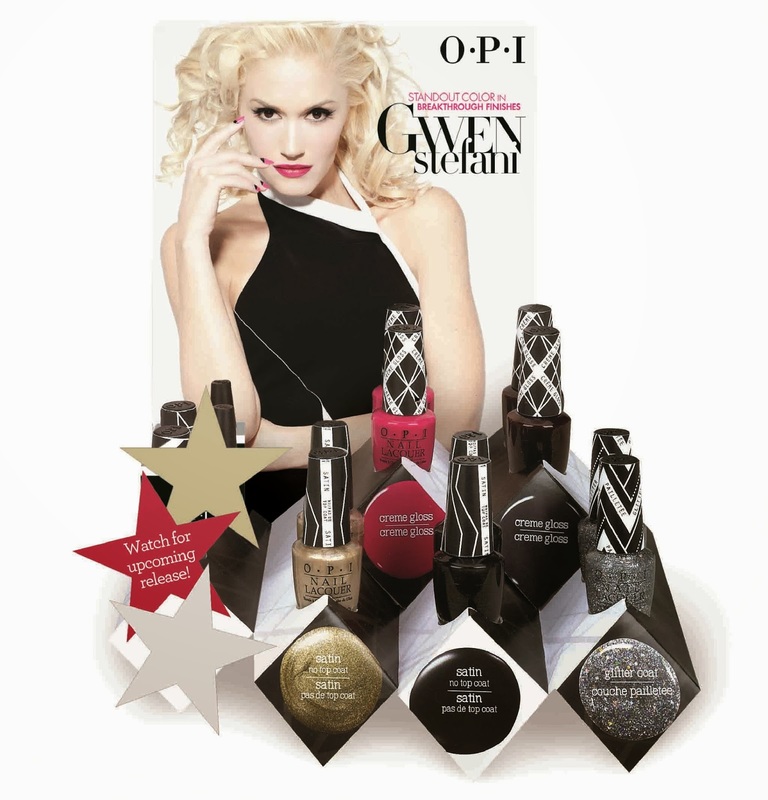 Gwen has partnered with professional nail care industry leader OPI to release seven new limited edition nail lacquers next year. Inspired by the 2013 Met Gala in New York City that featured the theme “Punk: Chaos to Couture,” the collection celebrates the role of music as a major influence in fashion. “With her expertise as a singer, songwriter and designer, who better to collaborate with than Gwen Stefani? Known for her trademark red lips, bold eye makeup and nail art, Gwen uses beauty to accessorize her style” says OPI Executive VP & Artistic Director Suzi Weiss-Fischmann. Gwen Stefani by OPI includes seven limited edition nail lacquers: Hey Baby, I Sing in Color, Love.Angel.Music.Baby., 4 in the Morning, In True Stefani Fashion, Push and Shove and Over & Over A-Gwen. 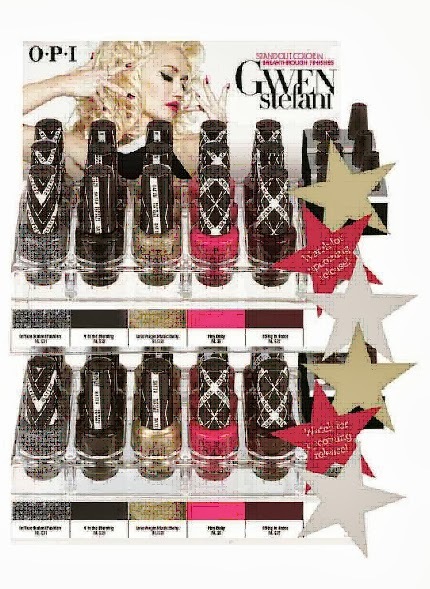 The latter color, Over & Over A-Gwen, was created to match Gwen’s signature red lipstick and is available in a boxed set that includes Swarovski crystals and studs to create inspiring nail art. Hello! I’d like to wish the beautiful Gwen Stefani a very happy birthday! I hope it’s an awesome day!!!! On another note, I’ve added the London September 24, 1997 show to the downloads section. Tony is helping to raise funds for Farm Sanctuary’s campaign against animal cruelty! I love him so! Go here for more information, to join his team, and donate to help them meet their goal! You are currently browsing the Greener Pastures – a No Doubt fan site archives for October, 2013.